In this age of rampant consumerism, what’s the best way to prepare for a major life event, like having a baby? BUY things, of course! Excessive consumption of resources and accumulation of “things” wreaks havoc on the planet and on personal finances. I know this, and so I strive to lead a life of simplicity and minimalism, but the message can be overwhelming at times. Lately, I’m fighting feelings that the lack of baby stuff around our apartment makes me a bad mama-to-be. Illogical? Yes! But the feelings are there nonetheless. Marketers work hard to convince us that buying and accumulating lots of baby stuff can prepare new parents for the major life transition they are about to experience, but that’s just not the case. The truth of the matter? Newborn babies have relatively simple needs: eat, sleep, poop and pee. We can meet most of these with minimal material investment. Eat: For the first 6 months or so, I should have this one covered. At some point, we will most likely introduce a bottle, and there may be a breast pump involved, depending on work arrangements. Sleep: The plan is for baby to sleep next to me in bed, which is “where babies belong” according to my anthropology professor, and where they sleep in many cultures around the world. To learn more about cosleeping, including how to practice it safely, click here. Poop and pee: Cloth or disposable? Turns out, those aren’t necessarily the only options. I’ve been reading about Elimination Communication (AKA Natural Infant Hygiene) in books like The Diaper Free Baby and Diaper Free: The Gentle Wisdom of Natural Infant Hygiene. Though I will have cloth diapers to use at times, I am very interested in this approach that cuts down on the number of diapers needed. 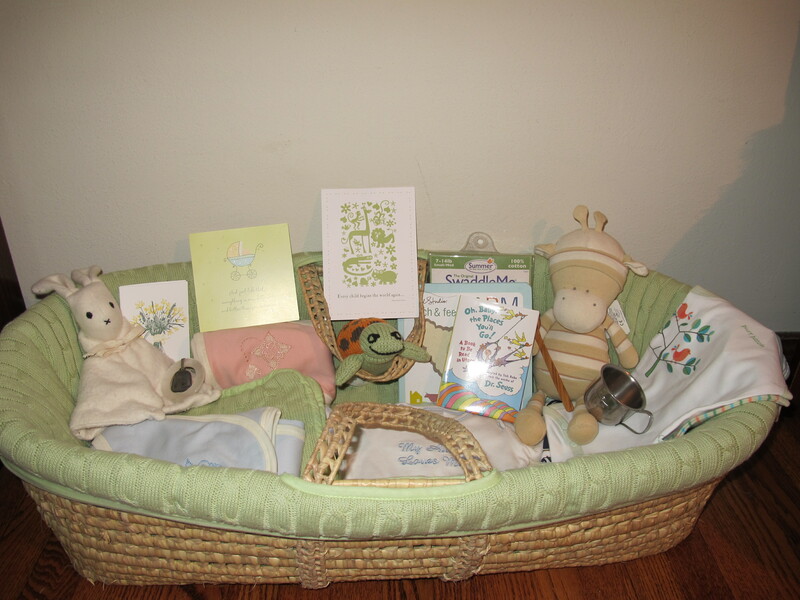 For now, our small collection of baby “things” fits nicely in this Moses basket that we found used at Kangaroo Kids. We’ll use the basket as a daytime sleeping place that we can keep near us when we’re not using a sling. Arranging the basket was fun and assuaged some of my “bad mama” guilt. When the time comes, we’ll have the basics covered, and we’ll provide a loving, nurturing family and home — something that all the money in the world can’t buy! This entry was posted in Green Ideas, My Life and tagged green baby. Bookmark the permalink. Sounds to me like you are having nesting urges! Glad organizing the basket helped. I think you should feel very proud that you aren’t filling your apartment with a pile of stuff for the baby. It’s much better to fill the baby’s life with love rather than stuff, after all! I realize this doesn’t exactly equate, but I used to feel guilty if I came home from buying cat food at the pet store without some new toy for the cats. One day as I was standing there in the cat toy aisle trying to find something that they didn’t already have, it hit me… they’d much rather have me come home a few minutes early and play with them than have another stupid toy!